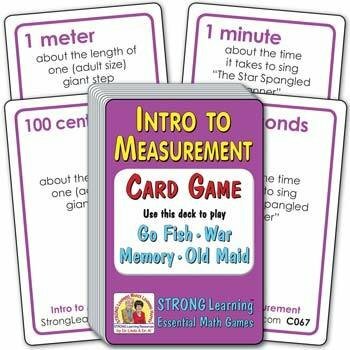 Players learn learn measurement concepts and facts (both customary and metric), all while while playing popular card games. For this deck, matches are cards that equal the same measurement expressed in different ways. Click here to view easy directions . Contents: 52 standard size cards, 3.5 x 2.25 in. (includes 48 playing cards, directions card, answer card and Old Maid card).